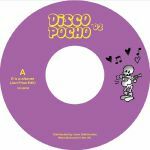 Review: After making a promising start with their first installment, Disco Pocho return with a second round of expertly selected, sliced and segued groovers from the parties of yesteryear. Javi Frias is the cat on the buttons this time around, taking two loose and limber disco funk burners and giving them just the right subtle touch to set the place alight. "It's A Shame" has an easy tempo, but there's more than enough heat embedded in the looped up slices Frias gets busy with - it's a dense, rugged and rock-tinged sound that should please Brass Construction fans. On the flip, "You Got What I Need" turns things up with a powerful, diva-led gem that's heavy on the one, just like it should be.